Being a customer oriented organization, we are highly engaged in manufacturing and trading a wide range of Designer Stainless Steel Gates. 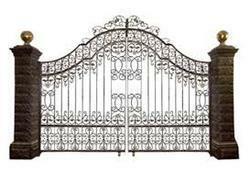 We are highly acclaimed in the industry for manufacturing and trading an optimum quality range of Fancy Stainless Steel Gate. We are engaged in manufacturing and exporting a matchless range of Automatic Stainless Steel Gates to the esteemed customers. It is available with steel bars and can also be availed from us in customized form. These gates are easily installed and can run over the frame automatically. They are manufactured and designed using premium grade raw material that is procured from verified and trusted dealers. Highly appreciated for our quality of Stainless Steel Swing Gates (stainless steel), we are manufacturing an enthralling collection of Stainless Steel Gates that are fabricated using high quality raw material. Widely acknowledged by our customers for their durable finish standards, these gates are employed in residential and commercial sectors. Why our Stainless Steel Gates?